One of the first things you learn as you start the transition to the low carb diet, is just how important proper monitoring of your food intake is. By accurately measuring the food you eat, you will be able to effectively stay on track with your daily carb allowance and make it much easier to meet your goals. When first starting the process of carb counting, it is essential to know how to read and decode ingredient and nutrition labels on the food products you buy. This way, you’ll know exactly what to look for, and how it all adds up at the end of the day. Once you pull together this quick formula, counting carbs is actually quite simple. But how do you find these bits of critical information on the nutrition and ingredient labels found on food products in Canada? Let’s take a look! The Government of Canada has implemented a much more standardized format for nutrition labels than what was available in the past. In fact, nutrition labeling became mandatory for all prepackaged foods in Canada in December of 2007, which has had a significant impact on the ability for consumers to educate themselves effectively regarding the nutritional value of the foods they purchase. 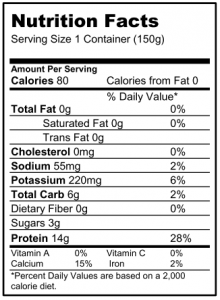 By using a standard format and layout for nutrition labels, it is now much easier to decode the potential health impacts of the foods we eat, regardless of the brand or manufacturer. Click here to visit the Government of Canada website page pertaining to nutrition label standards. 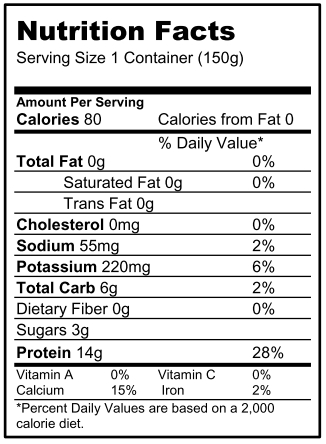 Here, we can see a typical nutrition label that follows the format required in Canada. This particular label is from a popular national brand of yogurt. On this label, we can see that this yogurt contains 6g of carbohydrates, 0g of fibre, and 3g of sugars. Using the method we described earlier, we can see that the net carbs that you should count as part of your low carb meal plan is 6g, since there are no sugar alcohols or fibre to subtract from the total. Of course, you should also pay close attention to the other nutrients found on the label, such as sodium and cholesterol. In addition, keeping an eye on the % daily intake of essential vitamins and minerals is also beneficial to understanding the total value of all the foods we eat. Lastly, it’s always a good idea to scan through the actual ingredients list on the product as well. This way, you’ll be able to determine exactly which ingredients are contributing to the carb counts listed on the nutrition label. For example, while that yogurt we showed above listed 3g of sugars, the specific type of sugar contained in that yogurt was fructose. There are other common sugars that you may find on the ingredient list including corn syrup, glucose, lactose, and sucrose. If there are sugar alcohols listed on the nutrient label, they will be found in the ingredient list with such names as xylitol, sorbitol or malitol. Other artificial sweeteners can be identified in the ingredients list by their brand or trade names, or even by spotting their logos on the packaging, and include such brands as Splenda, NutraSweet, or Equal. Aside from the nutrient facts and the ingredient list, one last thing that you should pay close attention to is the serving size that is used to determine all those values. Be aware that it is extremely common for a single serving, as defined by the manufacturer, to actually be less than what consumers would consider a single serving based on the packaging method or their typical eating habits. To become accustomed to thinking in ‘grams’ or ‘ounces’ for portion sizes, instead of just eyeballing it, invest in a small electronic kitchen scale and actually measure out the serving sizes listed on the packages of some common foods that you have at home. Once you see how much of the product is actually used to calculate the values on the nutrition labels, you can get a much more accurate view of how much you are actually consuming. The more you do this, the better you’ll get at estimating by sight and by weight, which will help you during those times when you don’t have a scale at the ready. If you are on the low carb diet for specific medical reasons, such as diabetes or other health conditions that require a carefully structured diet plan, the importance of properly understanding ingredient and nutrition labels is even greater. Be sure to consult your doctor for specific recommendations related to your health, and research using trusted and authoritative resources. For example, this helpful article from EatRightOntario.com contains a wealth of information for diabetics and what they should look for on the food products they buy. As you can see, there is a lot to think about when you start down the path to a better understanding of carb counting, nutrition facts, and ingredient lists. However, you can take comfort in knowing that the knowledge you gain from these experiences will make it much easier to achieve your short-term and long-term health goals, and will definitely help you get the most from your low carb lifestyle. We hope that this information has proven to be helpful, and wish you all the best with your low carb diet!